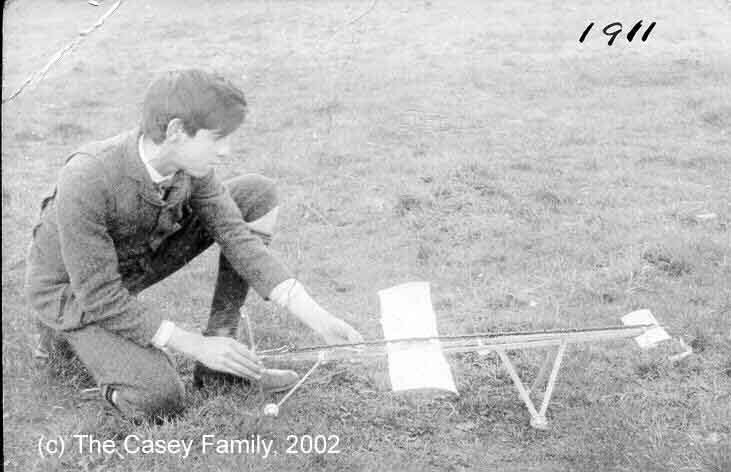 When I originally published this picture of Toby with a model aeroplane that he'd built in 1911 it was just to illustrate that flight was a dream of his from an early age. What I didn't expect was that over the winter of 2002/2003 a chap called Dave Burkin would get in touch saying that he'd seen the picture and wanted to recreate the model and get it into the air. He managed to achieve that and so I thought that I'd better add a page about it in order to thank Dave for his interest and the publicity that he's given this site. Dave spent the winter working on a 1/2 scale model and the result can be seen looking magnificent on the left. This was, by the way, no simple task. Firstly, all I know about this aircraft is the picture and a statement from my grandmother that it did actually fly. There are no plans and we don't even know how tall Toby was when the picture was taken so "half-scale" is based on a fair bit of guess work. It is, for example, very difficult to judge the wingspan from the photograph. 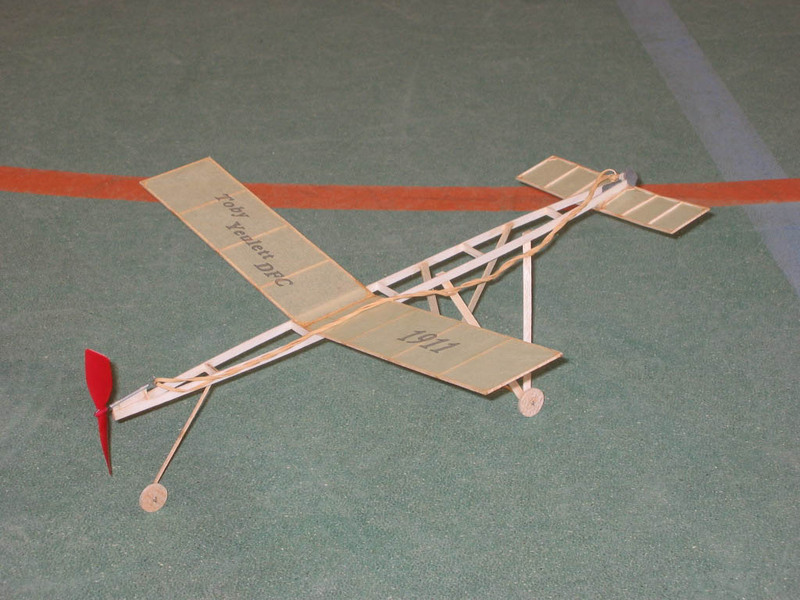 This picture was taken at a flying day held by Dave's modelling club, The Impington Village College Model Aeroplane Club near Cambridge, England, whose website you can view from the link. So, the next question was, would it actually fly? The picture on the right proves that it did and very successfully. The picture on the left is Dave holding his model. On the right it's flying left to right (it's a "pusher" with the prop at the back), it is turning to the left and climbing at the same time. 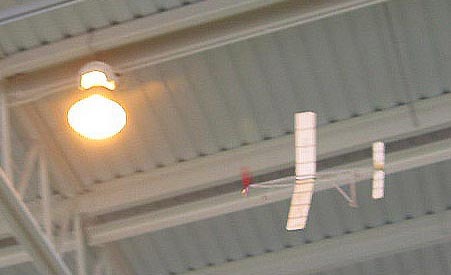 At first the flight time was limited with some rather interesting vertical landings but by the end of the day this plane was flying for 45 seconds and climbing right to the ceiling of the sports hall. Rather an impressive first day in the air for something built from 95 year old photograph. 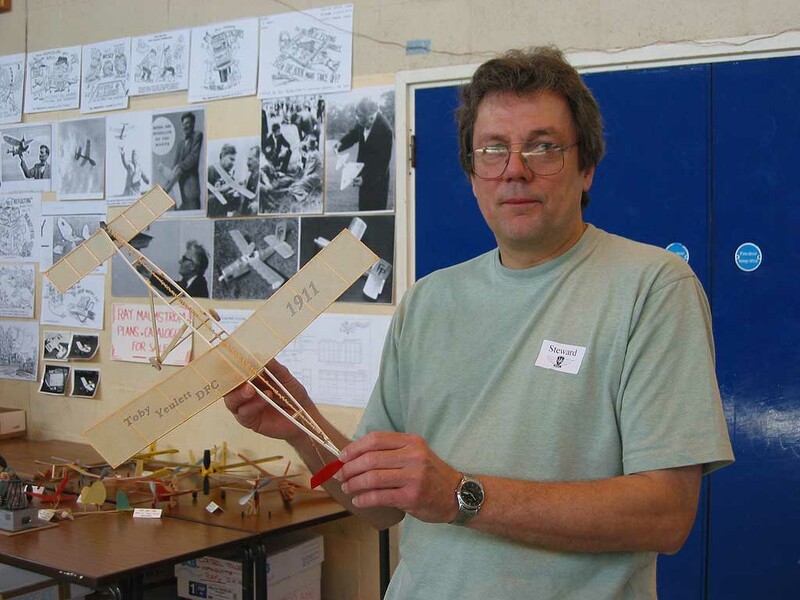 I'd like to take this opportunity to thank Dave for his interest and enthusiasm and also The Impington Village College Model Aeroplane Club for making me so very welcome on their flying day in March. It was a fascinating event with some truly remarkable models on view. If you get the chance to attend one of their days then I would recommend it since the detail and performance of some of the models are quite incredible. Thanks guys!